Astrocytomas: These tumors, which develop from star-shaped glial cells called astrocytes, range from slow growing and benign to fast-growing and malignant. 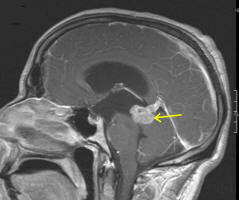 They are a type of glioma. Biopsy: The removal of a small sample of a tumor for examination by a pathologist. They are used to determine if a tumor is cancerous or non-cancerous. Blood-Brain Barrier: A wall of nerves and cells surrounding the brain membrane. While this barrier has a protective function, it also reduces the ability of chemotherapeutic drugs to effectively reach some brain tumors. : A wall of nerves and cells surrounding the brain membrane. While this barrier has a protective function, it also reduces the ability of chemotherapeutic drugs to effectively reach some brain tumors..
Brachytherapy: Also called interstitial radiation. Stereotactic techniques are used to implant radioactive "seeds" directly into a tumor. Also called interstitial radiation. Stereotactic techniques are used to implant radioactive "seeds" directly into a tumor.. Brain Neoplasm: Another name for a brain tumor. Another name for a brain tumor.. 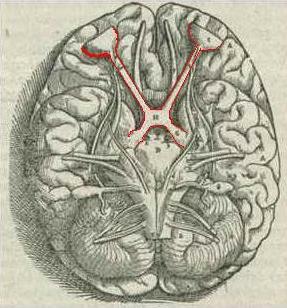 Brain stem: The brain stem, located at the front of the cerebellum, links the cerebrum to the spinal cord and controls various automatic as well as motor functions. 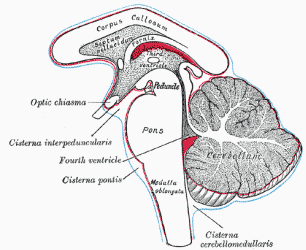 It is composed of the medulla oblongata, the pons, the midbrain, and the reticular formation. The brain stem, located at the front of the cerebellum, links the cerebrum to the spinal cord and controls various automatic as well as motor functions. 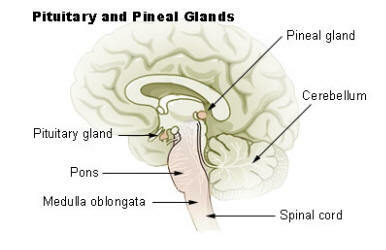 It is composed of the medulla oblongata, the pons, the midbrain, and the reticular formation.. Brain Stem Gliomas: These tumors are located at the base of the brain and occur more frequently in children than in adults. These tumors are located at the base of the brain and occur more frequently in children than in adults..
Cerebrospinal Fluid (CSF): This protective, clear fluid circulates through the brain and the spinal canal. When this flow is blocked-as may be the case with a brain tumor-hydrocephalus, or water on the brain, occurs. Images from a patient with normal pressure hydrocephalus (NPH) showing pulsations of CSF with heartbeat. 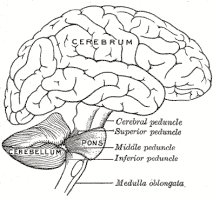 Cerebellum: Located at the back of the brain, the cerebellum controls body movement, i.e., balance, walking, etc. Located at the back of the brain, the cerebellum controls body movement, i.e., balance, walking, etc..
Cerebrum: The brain's largest section can be divided into two parts: the left and right cerebral hemispheres. These hemispheres are joined by the corpus callosum, which enables "messages" to be delivered between the two halves. The right side of the brain controls the left side of the body, and vice versa. Each hemisphere also has four lobes that are responsible for different functions: frontal (behavior, emotions, problem solving); temporal ( short-term memory, identification of sound and smell); parietal (touch, language comprehension), and occipital (visual processing, shape and color identification). The brain's largest section can be divided into two parts: the left and right cerebral hemispheres. These hemispheres are joined by the corpus callosum, which enables "messages" to be delivered between the two halves. The right side of the brain controls the left side of the body, and vice versa. Each hemisphere also has four lobes that are responsible for different functions: frontal (behavior, emotions, problem solving); temporal ( short-term memory, identification of sound and smell); parietal (touch, language comprehension), and occipital (visual processing, shape and color identification)..
Clinical Trials: These studies involve patients in the testing of new treatments and therapies and are part of the drug approval process in America. A clinical trial, which typically has three stages, or phases, gauges a drug's safety, effectiveness, dosage requirements, and side effects. Patients must meet certain criteria to be enrolled in a clinical trial (which is determined for each individual study), and participation in a study is voluntary. Clinical trials are sponsored by pharmaceutical companies, government agencies, and other healthcare-related organizations; many are based at research universities or hospitals. A set of rules, or protocol, is established for each trial. These studies involve patients in the testing of new treatments and therapies and are part of the drug approval process in America. A clinical trial, which typically has three stages, or phases, gauges a drug's safety, effectiveness, dosage requirements, and side effects. Patients must meet certain criteria to be enrolled in a clinical trial (which is determined for each individual study), and participation in a study is voluntary. Clinical trials are sponsored by pharmaceutical companies, government agencies, and other healthcare-related organizations; many are based at research universities or hospitals. A set of rules, or protocol, is established for each trial..
Computed Tomography (CT): This scanning tool combines X-ray with a computer to produce detailed images of the brain. This scanning tool combines X-ray with a computer to produce detailed images of the brain..
Cranial nerves: Twelve pairs of nerves responsible for various functions, including speech, hearing, taste, facial sensation and facial expression, balance, and smell. Craniopharyngiomas: These tumors of the pituitary gland most often affect infants and children. These tumors of the pituitary gland most often affect infants and children..
Cranium: The bony covering that surrounds the brain. 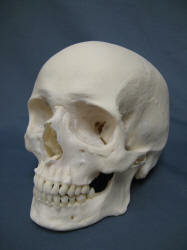 The cranium and the facial bones comprise the skull. The bony covering that surrounds the brain. The cranium and the facial bones comprise the skull..
"Eloquent" Brain: Areas within the brain that control the senses, motor functions, and speech. Areas within the brain that control the senses, motor functions, and speech..
Ependymomas: Generally benign tumors that develop from cells that line both the hollow cavities of the brain and the canal containing the spinal cord. These tumors most commonly occur in children. These, are generally benign tumors that develop from cells that line both the hollow cavities of the brain and the canal containing the spinal cord. These tumors most commonly occur in children..
Fractionated Stereotaxis Radiotherapy: The process of delivering doses of radiation in daily treatments in order to increase the total amount of radiation directed at a tumor site. Frameless Stereotactic Surgery: See ""Stereotactic Surgery." Functional Image-Guided Surgery (FIGS): A technique that combines Functional MRI (fMRI) with frameless stereotactic radiosurgery to optimize the safety and efficacy of treatment for patients with tumors located in the cerebral hemispheres. A technique that combines Functional MRI (fMRI) with frameless stereotactic radiosurgery to optimize the safety and efficacy of treatment for patients with tumors located in the cerebral hemispheres..
Functional MRI (fMRI): A technique that helps to pinpoint functional areas of the brain. While the MRI is scanning, the patient is asked to perform a series of activities and movements, such as reading a list or tapping fingers. The areas of the brain that correlate to these movements and activities "light up" on the scan and create an image. This information is used by surgical navigation computers in the planning of incisions, skull openings and tumor removal to minimize neurological deficits. A technique that helps to pinpoint functional areas of the brain. While the MRI is scanning, the patient is asked to perform a series of activities and movements, such as reading a list or tapping fingers. The areas of the brain that correlate to these movements and activities "light up" on the scan and create an image. This information is used by surgical navigation computers in the planning of incisions, skull openings and tumor removal to minimize neurological deficits..
Gangliogliomas: A rarely occurring and slow-growing form of glioma, gangliogliomas can be found in the brain or spinal cord. Glioblastoma Multiforme: These tumors, sometimes called high-grade or grade IV astrocytomas, grow rapidly, invade nearby tissue, and contain cells that are very malignant. Gliomas: A large category of primary brain tumors that originate from nerve cells called glial cells. There are many specific types of gliomas; see Astrocytes; Glioglastoma Multiforme; Mixed Gliomas; Optic Nerve Gliomas. Grade I tumors are slow growing; their cells are near-normal in appearance; and are not malignant. Grade II tumors have cells that are slightly abnormal in appearance and can spread to surrounding tissue. Grade III tumors grow quickly, contain abnormal cells, and spread to surrounding tissue. Grade IV tumors contain aggressive, abnormal cells that reproduce quickly. 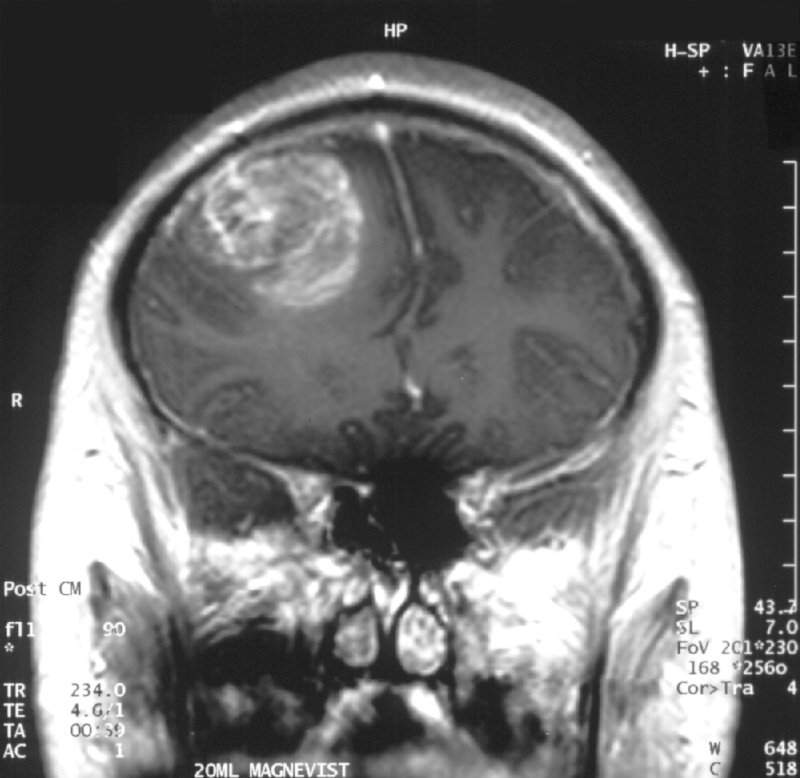 These are the most malignant of brain tumors. 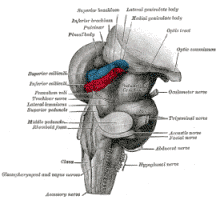 Hypothalamus: he part of the brain that acts as a messenger to the pituitary gland. It also plays an integral role in body temperature, sleep, appetite, and sexual behavior..
Intraoperative MRI: MRI images obtained during surgery to confirm the location of lesions, plan the operative approach, and evaluate the margin of the lesion resection. Left Hemisphere: The half of the cerebrum sometimes referred to as the "dominant" hemisphere. It has primary responsibility for speech and language. However, in some left-handed people, the right hemisphere controls speech function. Magnetic Resonance Imaging (MRI): This equipment uses a magnetic field to capture an image and can provide a three-dimensional image of the brain. 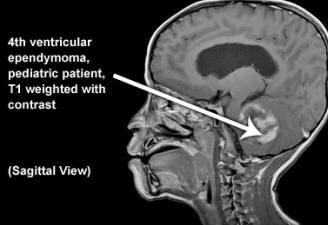 Medulloblastomas: These malignant tumors represent more than one-fourth of all childhood brain tumors. Medulla oblongata: This section of the brain stem connects the brain to the spinal cord. It is responsible for involuntary functions such as breathing, heart rhythms, and swallowing. 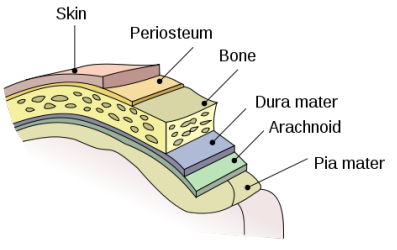 Meninges: Protective layers of tissue that surround the brain and the spinal cord. The meninges consists of the dura mater, arachnoid and pia mater. Meningiomas: Tumors that originate from the meninges, thin membranes that cover the brain and the spinal cord. These slow-growing tumors rarely become malignant or spread; malignancy occasionally does occur. Metastatic Tumors:These are malignant tumors that have spread from another part of the body. Midbrain: Part of the brain stem, it is the origin of the third and fourth cranial nerves which control eye movement and eyelid opening. Mixed Gliomas: These tumors contain more than one type of glial cell, are often located near the motor cortex, and most commonly occur in young men. Neuroendoscopy: The use of miniaturized, optically guided instruments that can be navigated directly to the tumor site. Oligodendrogliomas: Slow-growing, rare tumors that most commonly affect young adults. 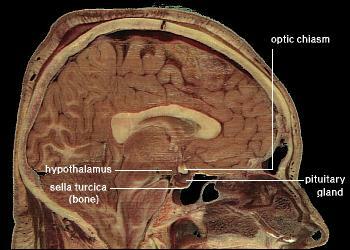 Optic chiasm: The area in the front of the brain where the optic nerves cross. 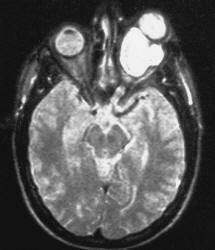 Optic Nerve Gliomas: Tumors that are found on or near the optic nerve. Untreated, they can interfere with vision, causing "crossed" eyes, or strabismus; bulging eyeballs; or loss of sight. 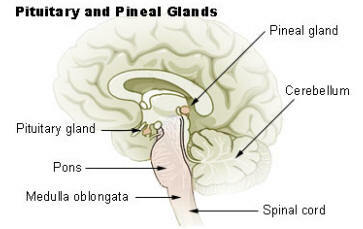 Pineal Tumors: Tumors near the pineal gland, a small structure deep within the brain that produces the hormone melatonin. They can be of about 17 different types, some malignant and some benign. 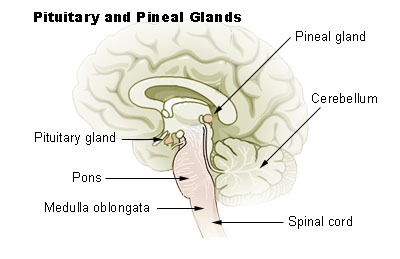 Pituitary Adenomas: These tumors are located near the pituitary gland, a small oval-shaped structure that supplies hormones. Hormones are chemical messengers that control many bodily processes, such as growth and metabolism. Secreting tumors release unusually high levels of pituitary hormones, which can result in a variety of symptoms-from impotence to abnormal body growth to hyperthyroidism-depending on the hormone involved. 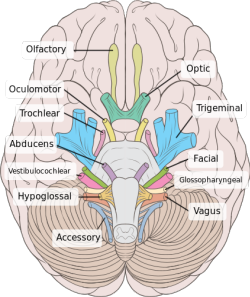 Pons: This part of the brain stem is the origin of four pairs of cranial nerves: fifth (facial sensation); sixth (eye movement); seventh (taste, facial expression, eyelid closure); and eighth (hearing and balance). 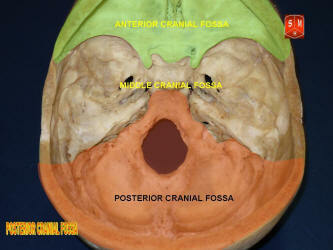 Posterior fossa: The part of the skull containing the brain stem and the cerebellum. 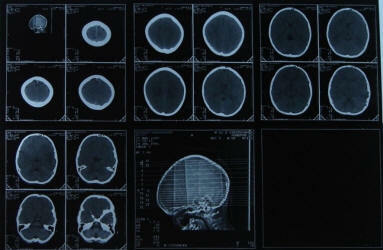 Primary Brain Tumors: Tumors that originate from within the brain. Primitive Neuroectodermal Tumors: PNETs, which usually affect children and young adults, originate from primitive cells left over from early nervous system development. PNETs are usually very malignant, growing rapidly and spreading easily within the brain and spinal cord. 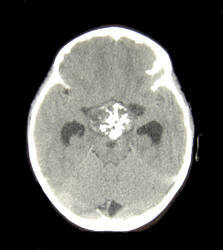 In rare cases, they spread outside the CNS. Right hemisphere: The half of the cerebrum that processes visual information. Schwannomas: These tumors, while usually benign, can affect balance and hearing, and may cause facial paralysis. They are also known as vestibular schwannomas or acoustic neuromas and may grow on one or both sides of the brain. SPECT: Single Photon Emission Computed Tomography, or SPECT, is a scanner that measures a low-dose radioactive material as it circulates through the brain. SPECT can be used to differentiate between low and high grade tumors. Stereotactic Radiation Therapy: The use of frameless stereotaxis to deliver small doses of radiation therapy to tumor sites. Stereotactic Radiosurgery: A non-invasive modality that precisely delivers focused, multiple beams of radiation to areas where they're needed-a single point on a tumor site-while avoiding healthy tissue. Stereotactic Surgery: A sophisticated, computer-based modality where a metal frame is attached to the patient's skull to provide a fixed reference point. 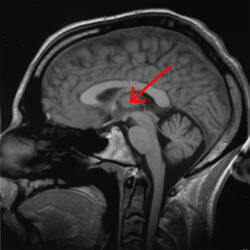 This point, combined with a three-dimensional image of the brain provided by a computer and MRI scanning, allows for precise mapping and visualization of the tumor and surrounding tissue. Precise navigation to the tumor site and optimal tumor resection is possible using a variety of surgical devices attached to the frame. Frameless Stereotactic Surgery: provides the same precision without the need to attach a heavy metal frame to the patient's skull. Frameless systems substitute a reference system created by "wands," plastic guides, or infrared markers. Thalamus: A small area in the brain that relays information to and from the cortex and translates impulses related to pain, attention, and alertness. Vascular Tumors: These rare, benign tumors arise from excess growth of blood vessels of the brain and the spinal cord. 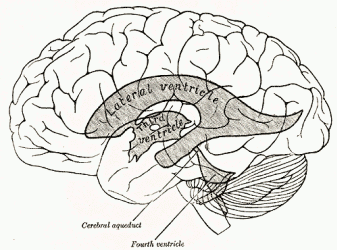 Ventricles: Four small cavities within the brain; they contain the choroid plexus, which produce cerebrospinal fluid.